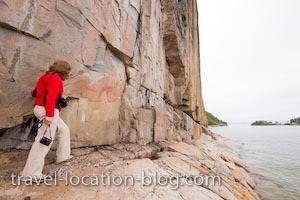 Situated on a flat rock face - called Agawa Rock, are the ancient pictographs which are likely to be between 150-400 years old. It's a tricky spot to get to and requires good footwear as the rocks are extremely slippery and there's hardly a ledge to stand on. The pictographs are not accessible when Lake Superior is rough.